As a big thank you to everyone who has taken the time to review The Revived, I have a short story/extra chapter I’m going to release when the book hits about 70 reviews across Goodreads, Amazon.com, Amazon.uk, etc. The extra is called Return to Luminos. I’m excited about it, because the next book jumps right back into the middle of things, and I did want to show you all the “Fun” that goes down when Kit and the others get back to the big city. Buwahaha. 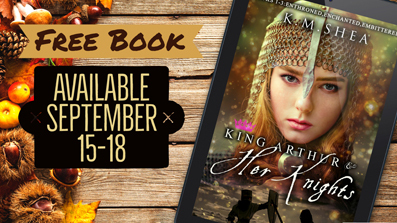 In other exciting news, the first King Arthurs and Her Knights Boxset is free today through Tuesday, September 18! This boxset contains books 1-3 (Enthroned, Enchanted, and Embittered) and some bonus material that isn’t available anywhere else. So even if you have a copy of the first three books, you still might wanna snag this boxset for the extras. Please feel free to tell any friends/family members that might enjoy the series about this deal as well! Thanks again for all of your support, Champions! I hope The Revived makes you laugh, and/or that you enjoy Britt’s adventures in ancient Britain. Have a lovely weekend! A-MEN! I love both of them *so* much! Wish granted! 😉 It’s out now–check out the newest blog post for the link. I loved Revived! I could help but enjoy the book and laugh out loud at times because it was sooo funny. I loved the way Kit became allies with the Pirates and the danger she was in when she almost got kidnapped when they were battling the spiders. I can’t wait to read the next books! Kitty you have done a wonderful job! Thank you, Tiffany! I’ve been “sitting” on the idea of those pirates since book 1 when I introduced her Swear Proficiently skill, so it was so much fun to be able to finally bring them into the story. That is amazing seeing how the details in the first books are used in later books. Like when reading the second book over there are the Solis Sentinels where a celestial being and dragon statue that reminds me of Pax and Sinistre. I also like how you tip your hat at LOTR with ‘The Password” for Milk Crown guildzone and Pokémon when Kit order Solus Miles to attack the queen spider. I can’t wait for the last two books. I can’t wait to see what Pax was talking about what will be available for Kit. Yay! So glad they’ll keep popping up. As a parent myself, I do have a soft spot for Luther and his getting things done while a two year old naps on him ;-). But yes, you can’t really take one without the lot of them! I’d forgotten you intended to do the next things as TWO more books, so now I’m extra excited. Yay “extra” (at least for my sieve-brain) adventures! Okay, this randomly posted here as well as as a reply further down. Sorry for the duplication, not sure how it happened! I sped through this so I could start reading it again, aloud, to my family. I had to pause while reading it last night when I got the part where Kit uses “Love’s Call” to summon Miles to the guild meeting because my husband and kids were laughing so hard! I often overhear the littler two using “my sweet honey!” in their play ever since we read the first two books. My husband really wants to know if the Retha books will ever be available as audiobooks. He has been thoroughly enjoying them and would love to listen to them (repeatedly) on his way to and from work. Keep up the good work, Kitty! We cannot say enough positive things about your books. Awww, thank you, Karen, that is so fun and cute to hear! (I am totally blushing right now.) That’s also awesome that you guys enjoy it as a family! As for audiobooks, I sadly don’t have any plans for that now–but it is something I would love to do in the future! Buwahaha, don’t worry that will come up eventually! The book was awesome. It was better than the first two parts and i laughed more. Noir and trash panda were great and noir’s babbling about everyone trying to make him a heal slave was hilarious. Alistair and teara were good too. Loved everytime georgie was taken a peg down. It was nice to see luther’s POV. And obviously kit, miles and paco were wow…. So glad you liked it! Trash Panda is like a secret vigilante hero at times. I’m hoping I’ll get to write a scene where he reaalllyyy goes for Georgie, buwahah! Just finished The Revived! I’m still processing it! I loved it! It was so funny; I loved getting to see Miles more, the Pirates had me all but rolling on the floor with laughter! I must admit, I keep drafting home-movie scripts of Retha in my head; the kinds me and my friends do. Or would, if it weren’t for school. And our non-existent special effects budget. Can’t wait to re-read – maybe I’ll even find a way to get my brother sucked into the series. He loved the humor in Dealing With Dragons, and your books are just as funny! First off, I am totally in love with Solus Miles (He’s so sarcastic and introverted and I want one). Second of all, this series would be amazing as a cartoon or as a series. I would totally watch that and since I was telling someone about the books and they mention how it sounded like a good TV show I cannot get the idea out of my head. This would be an amazing series. Please give us more soon! I’m so excited for the rest of the series! LOL. I have one! It is one of the reasons I love Miles so much, he is exactly what my BF would be like in that situation. I am greatly looking forward to spending more time with Solus Miles, myself! Loved him in this book, and enjoying all the new additions, too. I am happy that we got a little bit of the “old crew” out in the real world, too. I was terribly afraid I’d miss them if they were entirely out of the book. It’s so hard to wait for the next books! Hope it’s not too long, even though this one literally just came out! The sense of humor on Miles! I mean I knew he had to have one, because let’s face it a hero without one is not interesting. Noir’s personality was great; he made me crack up so often. But Miles really impressed me. Plus, the way the NPC’s ribbed him over Kit was straight up amazing. I was dying. I absolutely can’t wait for the next one. Way to rock it Kitty! Yeah, Fame and Fortune cracked me up. I love how the characters use them as revenge. Fortune coming out and telling Miles that he could use an armor upgrade was refreshing. I know we love Miles and his ability to take on anything he is up against, but it is nice to be reminded that he is human, too.